Schools will be making changes to school-based assessments in primary and secondary schools, to provide students with adequate time and space to adjust during the key transition stages. For the older students, it will also allow them more time to adjust to new subjects, and/or higher content rigour and expectations. These changes will be effected in stages. Currently, there are no semestral examinations for P1 and no Mid-Year Examination (MYE) for P2. From 2019, all weighted assessments and examinations for Primary One (P1) and Two (P2) students will be removed, and assessments conducted will not be counted to form any overall mark or grade. This includes removing the year-end examination at P2. Teachers will continue to leverage assessments to check for students’ understanding, and provide timely feedback to improve learning. Primary Three (P3), Primary Five (P5), Secondary One (S1) and Secondary Three (S3) are transition years, during which students will be exposed to new subjects and/or higher content rigour and expectations. We want to provide them with adequate time and space to adjust to the increased curriculum demands. Hence, the MYE for these levels will also be removed over the next three years (2019 to 2021), starting with the removal of MYE at S1 in 2019. This removal of MYE will free up to about three weeks of curriculum time for each two-year block (i.e. P3 and P4, P5 and P6, S1 and S2, S3 and S4). Schools will use this time to pace out teaching and learning and leverage engaging pedagogies to deepen understanding, and develop 21st Century Competencies in students. In addition, besides the MYE and year-end examination (at levels1 where this is applicable), schools will conduct no more than one weighted assessment per subject, per school term for all levels starting from P3 to S4/5. Scores from weighted assessments count towards a student’s overall result in a subject for the year. Each weighted assessment may be assigned different weightings and can take various modes, e.g. class tests, quizzes, presentations, group projects. The Holistic Development Profile (HDP), commonly known as the ‘report book’, will also be adjusted at all levels to better support a student’s learning progress. From 2019, the HDP will no longer present certain academic indicators such as class and level positions of the students. This is to enable each student to focus on his/her learning progress, and discourage excessive peer comparisons. With the removal of weighted assessments at P1 and P2 from 2019, MOE will guide schools to use qualitative descriptors to report students’ learning at these levels. For the other levels, where marks are used to report students’ learning, these will be rounded off and presented as whole numbers, without decimal points. With these changes, the reporting of each student’s progress in various domains will be better balanced, reducing excessive focus on marks. 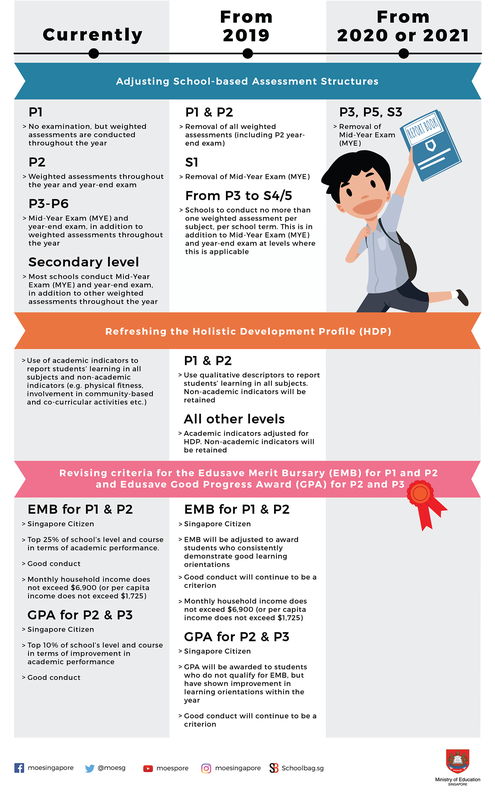 With the removal of all weighted assessments at P1 and P2, MOE will adjust the academic criteria for awarding the Edusave Merit Bursary (EMB) to P1 and P2 students and Edusave Good Progress Award (GPA) to P2 and P3 students. The selection of the EMB and GPA at these levels will no longer be based on academic scores, given that weighted assessments in P1 and P2 will be removed. Instead, the eligibility criteria for P1 and P2 EMB and P2 and P3 GPA will be adjusted to recognise positive learning orientations such as diligence, curiosity, collaboration and enthusiasm in daily lessons and learning activities. A summary of the adjustments and changes is at Annex A; items that will removed / adjusted in the HDP is at Annex B; and the current eligibility criteria for EMB and GPA is at Annex C.